This gift basket offers special gifts, indulgent treats and pampering spa products all selected to help make daughters feel very loved and appreciated. A beautiful gift boxed mug with the sentiment "God made you my daughter; Love made you my friend." 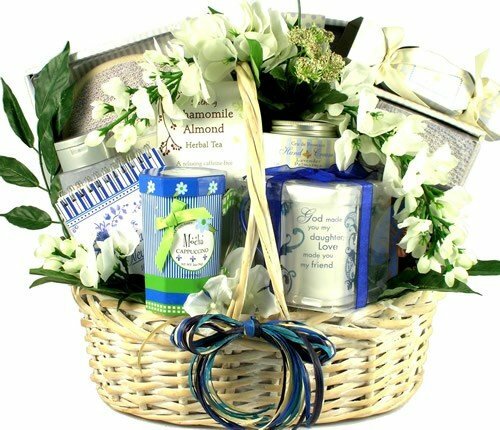 A gift book titled "Each New Day.. 101 Thoughts That Bless"
Features a beautiful mug that reads "God made you my daughter; Love made you my friend"
Proudly Made in the USA by our own gift basket design team and packaged for careful shipment when your order is placed..